Scott Borchetta stressed at the PRWeek Conference on Thursday that he wants his label's artists to be themselves. 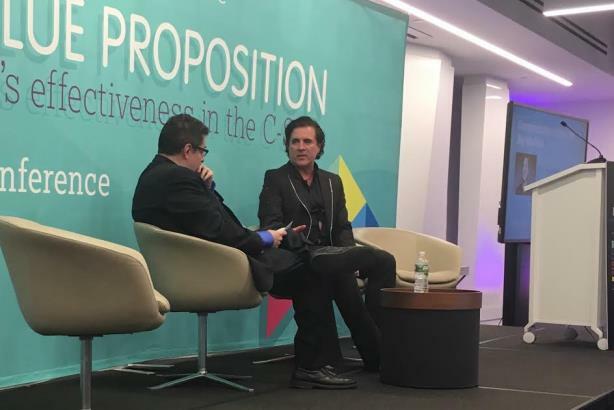 Big Machine CEO Scott Borchetta being interviewed at the PRWeek Conference on Thursday. (Photo credit: Diana Bradley). NEW YORK: Big Machine Label Group CEO Scott Borchetta, who discovered Taylor Swift, doesn’t worry about what she and other stars on his independent record label do on social media, he said Thursday evening at the PRWeek Conference. "I don’t feel it affects us," he said. "We support [Swift] in the record space with everything we’ve got, but she is her own person like all of our artists. We have to make sure we understand our vertical and protect our artists in that vertical and manage what we can manage. We are not in the business of the celebrity of our artists." Borchetta explained it is important for the musicians he works with, such as singers Tim McGraw and Steven Tyler, to be who they are. "This [millennial] generation has grown up in this space where everything is out to be criticized," he said. "One of the most important things we do from a comms standpoint is making sure that the narrative is accurate and that we are protecting it." Founded in 2005 by Borchetta, Nashville, Tennessee-based Big Machine’s other artists include Rascal Flatts and Reba McEntire. Borchetta noted that there have been times when he has "jumped on the grenade" to defend his artists and told critics they should attack him instead. "What social media ultimately does to everyone is it shows we are all human and you’re going to have days where you might make a mistake, and that’s OK," he said. Cleveland Clinic's Cosgrove: Obamacare now 'part of the fabric' of the U.S.